Aerovex Systems salon air purification and ventilation systems have been designed specifically for the salon industry. The salon air quality control measures include systems to remove salon dust and chemical vapors from nail technicians and hair stylists’ breathing zones in addition to purification of the ambient salon air. The company has also designed special filters for salon HVAC systems that take into consideration your unique salon requirements. Aerovex acquired of Cox Industries and Krisp Klean Air Systems in 2000. More recently, the company worked with a select group of cosmetologists and Schoon Scientific Regulatory Consulting to introduce the Chemical Source Capture System for Keratin Hair Straightening Applications. 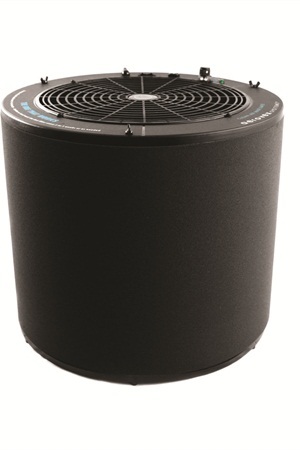 "The One That Works" Salon Air Purifier (shown) received Nails Magazine's Readers' Choice Award for Ventilation in 2005, 2006, 2007, 2008, 2009 and 2010. The invisible beachball-sized sphere of air that surrounds your face in all directions is a great place to start implementing efficient salon ventilation. NAILS walks you through all of the things you need to know, from what to look for in a ventilation system to how the components work to a few tweaks you can make in your day-to-day habits for extra protection. Get ready to breathe easy. The Sunflower II Nail Dust Collector from Aerovex uses powerful suction to draw in and capture nail dust. Since 1988, Aerovex Systems has developed innovative products to provide proper ventilation appropriate for all salon chemical services. Now Aerovex is unveiling two new state-of-the-art Salon Source Capture Ventilation Systems featuring “Healthy Air” technologies. The new “Healthy Air” source capture ventilation systems combine eHEPA technology with enhanced activated carbon filtration.